Verena Henrich and Erhard Hinrichs: The GermaNet Editing Tool. In Proceedings of the Seventh Conference on International Language Resources and Evaluation (LREC 2010), Valletta, Malta, pp. 2228-2235. The database is structured according to GermaNet, which means that there are tables to store synsets, lexical units, relations, etc. 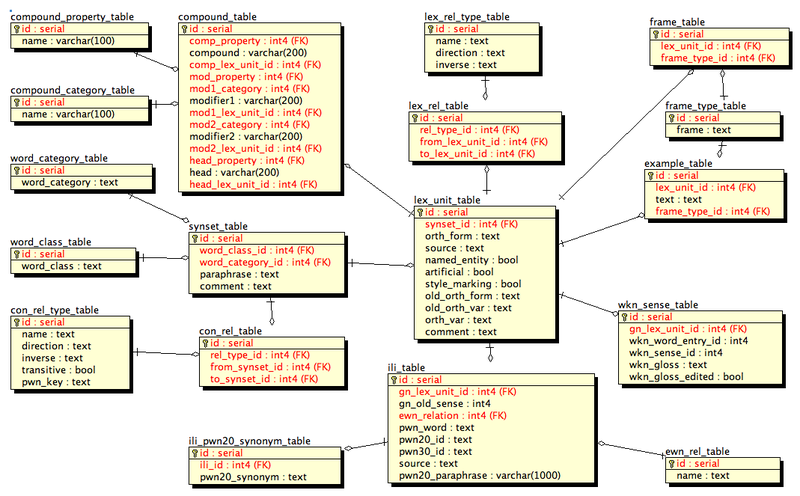 Figure 2 overviews the whole database structure. Each table is explained in detail in the below. Each entry in this table represents a lexical unit with all its information. Each entry in this table represents an example that belongs to a lexical unit. Each entry in this table represents a frame that belongs to a lexical unit. This table contains all possible frame types. All lexical relations are stored in this table. Here, all types of lexical relations are stored. Each entry in this table represents a synset with all its information. word_class_id: specifies the word class of this synset, e.g. Bewegung, Geist, etc. This table stores all possible word classes. word_class: the word class itself, e.g. Allgemein, Bewegung, Geist, etc. This table stores all possible word categories. This table contations all conceptual relations. Each entry in this table specifies one type of conceptual relation. This table contains all possible cross-lingual relation types from EuroWordNet. name: the name of the conceptual relation between GermaNet lexical units and WordNet synsets. This table contains alternative translations of a GermaNet lexical unit. This table contains links from GermaNet lexical units to Wiktionary paraphrases. This table contains information about constituents comprising nominal compound lexical units. This table contains compound properties, e.g. Abkürzung, Wortgruppe, Eigenname. 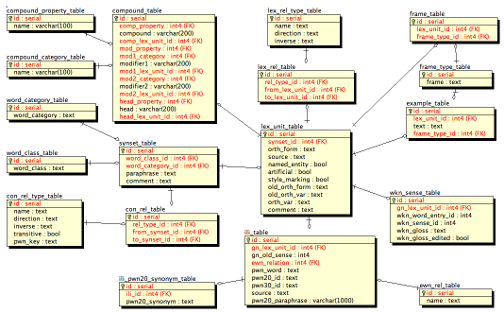 This table contains compound modifier categories, e.g. Nomen, Präposition, Pronomen.